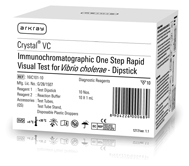 Crystal - VC (Dipstick) | ARKRAY, Inc. Rapid Visual Immunochromatographic Test for Detection of V. Cholerae in stool. 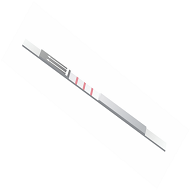 Rapid, visual qualitative Immnoassay with inbuilt control line. Two separate bands for simultaneous & different detection of V.cholerae O1 & O139 in a single test. All the component & accessories required to perform the test are included in the kit.